Jim Furyk has been a model of consistency for decades now. One unique swing. One golf teacher. (Mike, his father.) One wife. (Tabitha.) One caddie for the past 19 years. (Mike Cowan, aka Fluff.) One famous Tour record—the 58 he shot at TPC River Highlands in the last round of the 2016 Travelers Championship. Fifty-eight! Furyk has won 17 times on Tour, including the 2003 U.S. Open. That victory impacted the rest of his life. For one thing, he would never have been named as the 2018 American Ryder Cup captain without it. Listening to Furyk talk about his captaincy, it’s clear he has two principal goals: to get his 12 players in a place where they can play their best golf, and to contribute to an existing American Ryder Cup playbook that future captains can use. 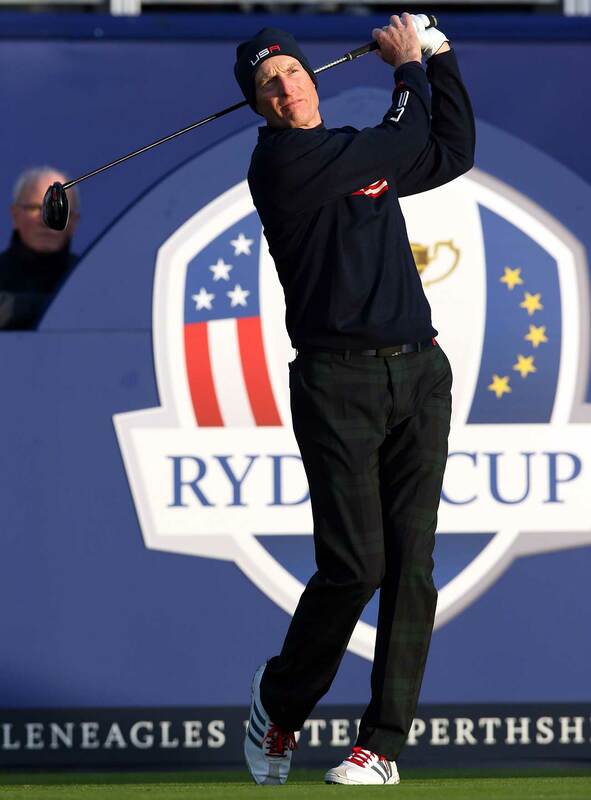 Of course, Furyk wants his team to return from Paris with the Ryder Cup trophy in hand. But he knows from experience—as a high school basketball player, as an NFL fan, as a player or assistant on 18 different Presidents and Ryder Cup teams—that the captain can’t play the shots. He is a manager. Furyk follows Davis Love as Ryder Cup captain. Furyk played for Love when Love captained the U.S. team in its 2012 loss at Medinah, and he was a vice captain under Love when the U.S. won in ’16 at Hazeltine. Furyk knows that Love, to use a baseball phrase, was a “player’s manager.” Furyk follows in that tradition. But the touches are his own. On the eve of the PGA Championship, in a secluded, plush second-floor room in the clubhouse of Bellerive Country Club, Furyk, 48, offered long, thoughtful answers to questions about his playing career, his Ryder Cup history and how he will lead as U.S. Ryder Cup captain. Do you remember Tabitha giving red, white and blue pajamas to the 2012 Ryder Cup team? It sounds like the kind of thing she would do. Davis Love mentioned it at the time. He would know. Let’s start with 2012, because I think there’s a continuum here. I’d agree. It goes from ’12 to ’14 to ’16 to ’18 and hopefully it goes on from here for the next 20-plus years. After the 2014 Gleneagles rout, Team USA regrouped and rallied to win at Hazeltine. That had to be tough, 2012—the four-point lead going into Sunday and then losing by a point. What’s your clearest memory of it? Well, I lost my match on Sunday, to Sergio [Garcia]. I left there with that hollow feeling that I could have made the difference. And I felt bad for Davis, because he put everything he had into that team, and we didn’t get it done for him. Medinah was the total opposite of Brookline, in ’99. I played Sergio there, too. With a different result. Right. We turned the tide on them in ’99, just like they turned the tide on us in ’12. Do you remember David Duval cupping his ear with his hand at Brookline, trying to get the fans more into it? That’s Ryder Cup golf. That’s why people love it so much. You see the players so passionate. You see people acting and doing things they normally wouldn’t. Like what David did. You’re playing for your tour, your flag, your country, your teammates. That’s why it’s golf greatest event. You could say it transcends golf. It does. It’s like a football game broke out in the middle of a golf course. When you say football, our American football or their football? Our football, of course! But any football, really. I like to say soccer, because it rubs them the wrong way. Did you ever play football? I played football until eighth grade. Played some high school baseball. Played basketball until I broke my thumb right before the start of senior year. What do you take from your experiences playing team sports as a kid to your captaincy of the Ryder Cup team? All my best friends in high school were my basketball teammates. We loved hanging out together. We partied together, we sweated and bled together. When you accomplish something as a group, you’re bound forever. That’s what I like best about the Ryder Cup. I hate practice rounds. But I love Ryder Cup practice rounds, because the guys you’re playing with are on your team. Are there any lessons you have taken from your high school basketball coach that you’re using as Ryder Cup captain? Pat Mowrey. Coach Mowrey worked us pretty good. He had some Herb Brooks in him. He wanted us to be pissed at him so we would be closer. I liked Coach Mowrey. He was strict. He was tough. He made you accountable. But when you did something well, he patted you on the back. He wanted to see you be proud of your accomplishments. Coach Mowrey sounds like Tom Watson in ’14. Tom’s very stern, very forward. That’s his mentality. That’s his personality. One thing I’ve learned from all the teams I’ve played on is that the captain has to be true to his personality. I’m not a cheerleader. If I cheerlead, guys will look at me like I’m crazy. But that idea of being accountable, I’m sure that’s what Tom was getting at. Look, what happened that year happened. And we learned a lot from it. Tom poured his heart into that team for two years and I admire him for doing that. What do you remember about that press conference, in which Phil appeared to openly criticize Tom for his leadership? We had lost. We were going to take criticism. You’re still trying to process it. I think the only thing you can say is, “They played better.” It wasn’t like that. I sat near the end of the long table. Only Jimmy Walker was to my left. Tom said what he said, Phil said what he said, and I would say both comments were a little awkward. Jimmy leans into me and says, “Is this how it always goes?” I’m like, “No!” Then a question comes to me: What did I think of their comments? I was between a rock and a hard place. I rode the fence. Phil and I have been close friends since we were kids. Our wives are very good friends. I said to Phil later, “I hope we’re okay.” He said, “We’re fine. You had no need to jump into that.” But that moment was pivotal, wasn’t it? It led to a bunch of us getting together at PGA headquarters with ideas that would be the key to our future. What I said in those meetings is that we’re looking at everything in the short-term. We were changing offensive coordinators, changing offenses, every two years. It was all now, now, now, now. I said we have to be prepping our vice captains to someday become captains. Davis was the only captain I played for who had ever been a vice captain. When we were talking about who would be the captain for ’16, I called Davis and said, “You better be ready. I think it’s going to be you. Because you’re the only guy who checks off every box of what we’re looking for.” That included having a captain who had been a vice captain. Every successful business is run with long-term goals. We weren’t doing that. In the future I’m going to be the least experienced captain we’ve ever had. I served as a vice captain once. In the future, Ryder Cup captains will have been a vice captain at least once if not more. You named Tiger as one of your vice captains early on. You’ve known him for a long time. What’s your relationship with him like? I played with him in Vegas in ’96, when he won on Tour for the first time. We weren’t ready for him, as a Tour. The roping wasn’t adequate. There were people all over the place. I got a little flustered. But I could see we played the game in a similar style, except for that part that he was 40 yards longer. I play the game by feel in my swing, but I work my way around the golf course in a technical fashion. I play by the book, by the percentages. That’s really what Tiger does. And our humor is similar, kind of biting humor, a sarcastic sense of humor. We both like to talk trash. Can you cite an example of the humor? Probably not. Tiger helped you guys make a lot of money. He did. And hopefully it keeps going from here. Do you fly in private planes a lot? In the continental U.S., yes. When you do that, do you have to put your clubs in a travel bag? You don’t. Sometimes you can bring them right in the cabin. But if you’re mad at them, you can put them underneath, let ’em freeze. Let’s talk some about the USGA. After you won the Open, did anything change in your relationship with the USGA? Not really, it didn’t change much. After I won and I got the trophy, they told me it was my job to get the trophy engraved. I thought they were kidding, but they weren’t. So I called the Tour and asked them to recommend a place. I sent it to a guy in Connecticut. I think it’s changed since then, but that’s what it was like for me. They said, “Just bring it back next year with your name on it.” What’s your take on what’s going on with the USGA? Well, they’ve made it so easy to pick on them. The greens at Chambers Bay [in 2015]. How they handled Dustin Johnson’s situation at Oakmont [in 2016]. Then, with that gal [Anna Nordqvist] that same summer, in the Women’s Open. That was a travesty. Some of the pin placements at Shinnecock, on Saturday, on 13, 15 and 18. Plus, they changed the course so much from the last time we were there. The anchored putting ban. Now the green maps. But it was the USGA that let putting get there, let the maps get there. Then they want to turn it back. So it’s tough. But what I think people don’t realize is that they’re trying. They’re trying to do what’s right for the game. I know [USGA CEO] Mike Davis. I like Mike. But I don’t have a good relationship or a bad relationship with the USGA. I just don’t have much of a relationship. I’m not trying to be critical of the USGA. They have the best interests of the game at heart. They really do. You won your Open with Fluff caddying for you. Tiger won his first Masters with Fluff. Does Fluff have other majors? I think just those two. Does Tiger come up in your conversations with Fluff? Not too much. He’s more likely to talk about Jake [Peter Jacobsen]. They were together for 18 years. What’s Fluff’s role at the Ryder Cup? He’s the caddie captain! Fluff and I go beyond caddie-player. He’ll always care about my family and me, I’ll always care about him and his family. Let’s wrap-up by going back to the Ryder Cup. In 2004, Hal Sutton paired Tiger and Phil together twice on the first day, and they lost twice. You were on that team. What was your take on that? I think that pairing was done to show everyone else that we’re a team. But I don’t care what everyone else thinks. I care about what our team thinks, not what millions of other people think. I’m going to be polling the players. I care about the 12 people in the room. If I know they love each other and they know they love each other, I don’t care what anyone else thinks.